I’m not sure what it is – maybe it’s the short winter days, but it feels as if January has just flown by. I glanced at my calendar the other day and realised I only had a matter of days to get my monthly Gourmet, unbound post up. Luckily something from the archives caught my eye straight away – a recipe for shrimp and pork pot stickers from the February 2006 issue of Gourmet. Also known as guō tiē in Chinese, which literally translates to “pan stick” (hence the American name of Pot Stickers) or gyoza in Japanese, these little pan-fried dumplings are a real treat. While both versions are quite similar, the guō tiē usually contains mostly pork and chinese chives, while gyoza may contain a myriad of fillings, hence I have named these after the latter. I have tweaked the Gourmet recipe a little – changing the ratio of prawn to pork and adding some shiaoxing wine and cornflour. I’ve also added some shredded ginger to the dipping sauce for extra freshness. To save time I bought ready-made dumpling wrappers, although making your own seems pretty straight-forward (instructions to do so can be found within the original recipe). The secret to perfect pot stickers is in the cooking – don’t move them once they touch the oiled pan so they can be left to develop lovely crusty bottoms, I’ve also included a second addition of oil which I find makes them extra crispy. The portion below will serve four as a starter but once you start you won’t be able to stop popping them so I’d advise you to make a little more – you can always freeze any uncooked gyoza for later use. While the prawn and pork mixture is chilling prepare the dipping sauce by mixing all the sauce ingredients in a bowl. Set aside at room temperature (for up to 3 hours) until ready to serve. Stir again briefly before serving. Line a large baking sheet or rectangular dish with paper towels and dust lightly with flour. Place a wrapper on your palm, then put 1 heaped teaspoon of the filling in the centre of the round. Moisten the edges with a wet finger and fold it over in half to form a half-moon shape. Using your thumb and forefinger press to form 10 to 12 tiny pleats along the edge to seal. Shape the dumplings so that the base of the dumplings are flat. Place finished dumpling on the floured surface and repeat with the remaining wrappers and filling. Heat 1 tbsp vegetable oil in a large nonstick skillet over medium heat until hot but not smoking, then carefully place the dumplings on the pan, seam sides up. Fry dumplings for 2-3 minutes, until bottoms are pale golden then add 1/2 cup water and quickly cover with a lid. Leave the dumplings to steam until all the liquid has evaporated (about 5-6 minutes), if the pan is dries up quickly and the seamed edge still appears white and uncooked add a little more water and replace the lid. Note: Dumplings can be made a day in advance and kept (uncooked) in the fridge. Place on lightly floured paper towels, not touching and loosely covered with more paper towels, in an airtight container. If you wish to keep them longer than a day, then freeze them – when you wish to cook them do not defrost, just cook straight from frozen, leaving them in the pan a minute or two longer than you would from fresh. *can be found in the refrigerated section of any Oriental supermarket, they should be white – do not use the yellow wonton wrappers as they taste different and don’t pan-fry well. ~ by gourmettraveller on January 30, 2010. Mmmm….delicious! My family’s all time favourite. Pork and prawns are a great combination. My family eat these often. One of my all time favorite Asian appetizers. 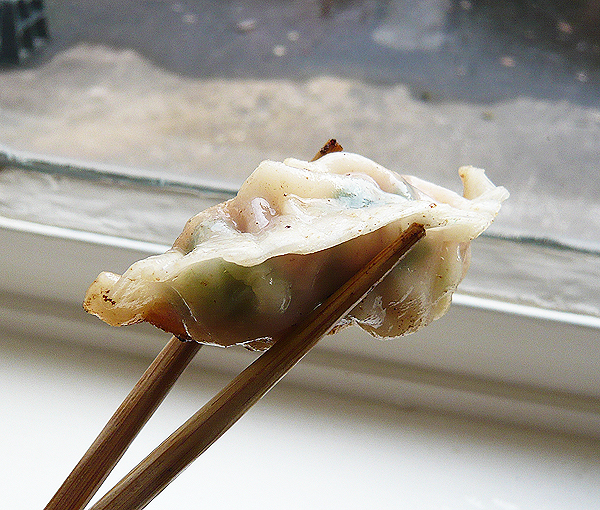 I made my own won ton skins once upon a time. Never again! Like making phyllo…and why? They’re so inexpensive and good out of the package. These look and sound delicious. I like the filling ingredients very much. I haven’t made pot stickers in forever – but these look wonderful! I am going to have to make them – and I have to say, the premade wrappers are great, since I have very little patience for making perfectly thin rounds of dough. Your picture is excellent!